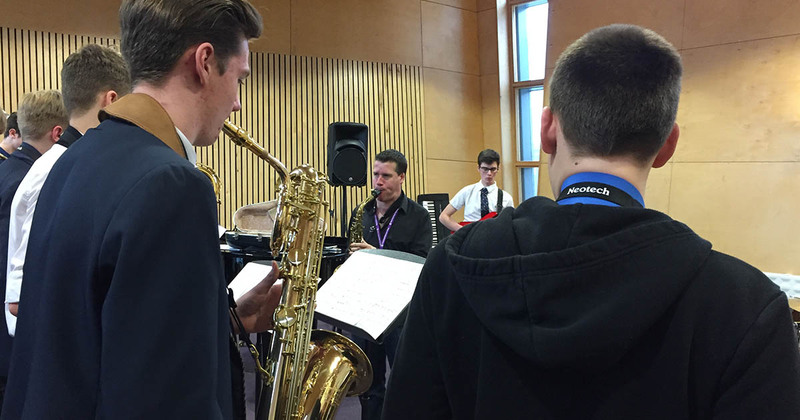 Barton Peveril Sixth Form College held a Jazz Workshop for 25 of the region’s school musicians, which was run by Barton Peveril Teacher of Popular Music and Jazz Studies and leading UK Jazz Saxophonist Simon Allen. Pupils from The Mountbatten School, Wyvern College, The Henry Beaufort School, Brookfield Community School, The Trafalgar School at Downton and Bohunt School attended the workshop. The workshop ended with the school pupils performing in a Twilight Concert in the College’s Rose Theatre alongside Simon Allen and current Barton Peveril students. The event aimed to give local school pupils, who have a passion for music, an insight into performing on a larger scale in both a small and big band; the pupils who attended the day play a range of instruments including trumpet, trombone, saxophone, guitar, piano, bass and drums. Barton Peveril students were present throughout the day, supporting the pupils and offering their expertise as regular performers in the College’s various music productions and performances.